Today was a fabulous interview with Joe MCQuillen an Irish man for sure. 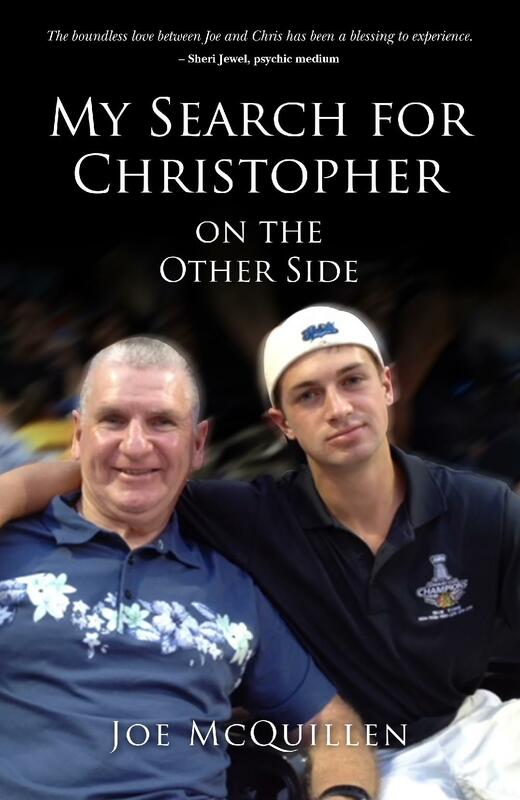 He has written an unforgettable book of a father's relentless love for his lost son. Joe McQuillen's life was turned inside out when he recieved a call that his son, Christopher, along with three of his friends,went missing. They had been at a friend's lake house celebrating the end of Christmas break from college. Sometime during the evening of revelry, the four young men jumped into a canoe, paddled out onto the icy lake,capsized and drowned. Christpher's body was recovered first; the others over the next dark days. Thus began Joe's journey through grief,awakening,discovery and acceptance as he - through mediums,research and eventually, direct communication- navigated his personal bridge to the other side! Joe Mcquillen has been married for 27 years and is the father of three children, one on the "other side." Joe was the younges of 10 children from an Irish-Catholic family, and although he is at heart a clue-collar kid from Buffalo NY. starting as a salesman, he spent 25 years in the automobile business, wroking his way up to executive manager and partner in a number of successful Chicagoland dealerships. After selling out in 2009, Joe began his second successful career as a mortgage broker. His website is www.JoeMcQuillen.com. When will I be good enough? I feel blessed to do the work that I love, as an intuitive life coach, author, inspirational speaker and radio host. My spiritual work has enabled me to help many people to live the life they desire! This work has brought me great joy and inspired me to do even more! My faith in the Lord is what motivates me to be a messenger to others. I have learned many things thus far in my lifetime and would like to share this knowledge with you! I feel that it is very important that I share my spiritual findings with you because I realize that if I had been given this wisdom in my early days different choices may have been made as a result. Although every day is a learning experience my hope is that on High Road to Humanity (Podcast) and in my Magazine articles, Books and Videos, I can share some of those life changing secrets with you. The goal is for this wisdom to flourish to those who want to get on that High Road a little bit quicker and enjoy a much smoother ride! Throughout the years my spiritual education has grown. My formal training has come through many invaluable religious and spiritual teachers, in New Mexico, Michigan, California and Mexico and real-life experiences! My intuitive abilities through mediation and prayer have enhanced my gifts. My schooling encompasses hands on energy healing with an Aztec healer from Mexico as well as intuitive coaching and public speaking. I am the Owner and Qualifying Broker of The Harville Estates Real Estate & Development LLC, Owner of Energy Girl Publishing LLC., and author of, Wake Up! The Universe Is Speaking to You, featured monthly article in The Eden Magazine. I host a weekly Podcast High Road to Humanity every Wednesday where my guests share their wisdom. I am happily married to the love of my life. We are blessed with two wonderful daughters and three fabulous grand children who keep us both young. Owner of Energy Girl Publishing LLC. Througout the years I have enhanced my own my intuitve abiblites through meditation and prayer, and faith in God thus obtaining many invaluable tools for life. The tibetan monks have influenced my teachings greatly as had Billy Graham and Edgar Cacey and Louise Hay. My gifts include intutive card readings, Intuitive Life Coaching and speaking my wisdom to help others. May the Lord bless you and keep you always.